Consumers is moving more aggressively than the state has mandated in phasing out coal-fired generation. Michigan utility Consumers Energy has filed a clean energy plan with state regulators that includes a promise to add 5 gigawatts of solar through competitive bidding by 2030, as part of its goal to cut carbon emissions by 90 percent and phase out all of its coal-fired power by 2040. And, in a change from its first solar proposal filed last year, Consumers has included a 50-50 split between utility and third-party financing of its massive new solar goal — a move that has gained support from the environmental groups, consumer advocates and the state’s attorney general’s office. Monday’s settlement plan filed with the Michigan Public Service Commission (MPSC) is the result of nearly a year of negotiations with these parties over Consumers’ effort to merge two key policy efforts. The first is developing its first-ever integrated resource plan (IRP), as required under a 2016 state law. The plan will guide the utility's procurement of energy over the coming decades. Consumers filed its initial plan in June 2018 (PDF), followed by the settlement plan released this week. The second imperative is Consumers’ decision to move more aggressively than the state has mandated so far toward phasing out coal-fired generation and growing its renewable energy portfolio. Michigan law requires renewable energy to make up 15 percent of an electric utility’s portfolio of resources by 2021, which is on the low side in terms of state renewable portfolio standards. But last year, Consumers and fellow Michigan investor-owned utility DTE Energy agreed to commit to a “50 percent clean energy goal” by 2030 — a plan that includes both big improvements in energy efficiency to reduce consumption, and a pledge that 25 percent of their electricity will come from renewable resources by 2030. Consumers, which serves about 6.7 million electric and gas customers in Michigan, adopted the name “Clean Energy Plan” for its IRP to emphasize this shift, Katie Carey, the utility’s head of media relations, said in a Monday interview. The MPSC is now reviewing the proposal, and has not set a timeline for its next decisions, she said. Most of the plan submitted Monday is identical to the plan Consumers submitted last year, she added. That includes its pledge to reduce carbon emissions by more than 90 percent and phase out coal-fired power completely by 2040, as well as its goal of 5,000 megawatts of new solar by 2030 and an additional 1,000 megawatts by 2040. The key change is the move from a utility-only solar procurement structure to one split evenly between Consumers and third parties, Carey said. This type of 50-50 compromise has been a hallmark of utility solar investment plans of this type, starting back with some of the landmark programs in California. 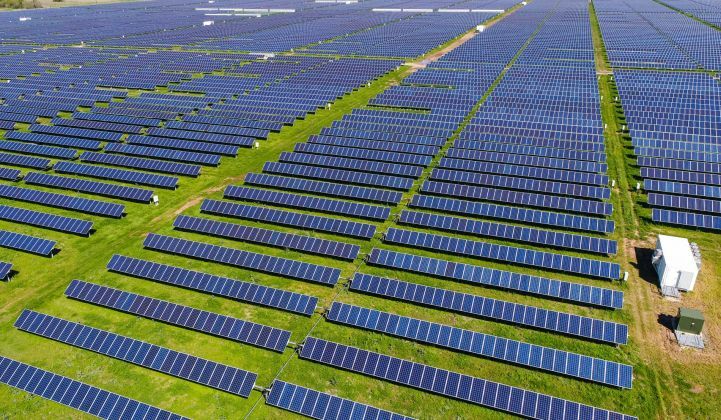 In simple terms, utilities often initially propose financing the entirety of the renewable energy they’re seeking, citing their low cost of capital and thus lower costs to ratepayers compared to third-party solar providers. Of course, utilities often have an incentive to own capital investments as well, since they’re offered a guaranteed rate of return on these investments. “I think it’s safe to say that there were concerns on the competitive bidding front” along these lines, Carey said. In terms of 100 percent utility ownership, “we liked the model for the affordability that it would provide for our customers,” with Consumers estimating that the cost impacts to customers to finance the solar RFPs would remain well below the rate of inflation. But moving to a 50-50 split between the utility and third parties allowed the groups opposed to the initial plan, including environmental groups such as the Sierra Club and the Natural Resources Defense Council and the state’s attorney general, to sign on to the new plan, she said. Consumers' clean energy goals, by contrast, were taken up independently of any state mandate — although not independent of political pressure. Last year’s clean energy commitments by Consumers and DTE were made in exchange for a promise by a group backed by California billionaire environmentalist Tom Steyer to withdraw a state ballot initiative that would have set a renewables mandate of 30 percent by 2030. But Consumers is also seeking to modernize its generation mix in light of market realities, Carey noted. The utility has closed seven of its 12 coal-fired power plants in the past two years, and under its plan will phase out two more in 2023, two more in 2032, and the final one in 2040. At the same time, it plans to add about 550 megawatts of wind capacity by 2021, and has begun to pilot battery storage systems, with an eye on incorporating energy storage into its resource mix in the years to come. While Michigan is ranked relatively low in terms of its share of solar power relative to other states, it is one of four Midwest states positioned for fast solar growth over the next five years, according to the Solar Energy Industries Association. The others are Illinois, Wisconsin and Ohio.